I've been feeling some better but still have so much to do, don't know where to start. Thank you so much to all of you that have left such uplifting comments, it feels good to have such good friends. I really have no where to go but up, working on it! Last Wednesday, our town had the distinction of becoming the first in our state to have the swine flu. Schools were out last Thursday and Friday, to the delight of VolleyGirl and her friends. Most of them opened today but the elementary ones are still closed. It has also been raining for days....buckets and buckets. We were dealing with a leak too, so we were constantly going in the attic. Mr. Unplugged and I worked on getting a gutter cleaned out yesterday and both got soaked, we feared it would break....finally got it. I still have not had time for art and when I do get back to it, feel I should be working on something to post on ebay or getting prepared for a show. I am trying to keep my mind away from all that needs to be done and focus on what I can do just today. Wanted to share some art, so here is one of two portraits in ink that my son did as his final assignment for a class last week. He comes home this Friday for the summer!!!!!! I can't wait to see him, though the cooking and washing will go up I fear. Have a great Monday everyone! You know sometimes when it rains it pours.. . like wise life. I know how you're feeling right now. We just need to take some time for us now and then and get important things in hand. My friend used to say, Dont sweat the small stuff. We miss you but we are still here for you so do what you can. Oh goodness.. I forgot to mention your sons wonderful Art work. VERY NICE JOB ON THE DUKE. Hes got lots of talent there. My hubby LOVES JW, so I printed this picture out to show him. He was impressed. I'm thinking of you, down there with so much to do. I surely hope they stamp out that flu bug soon. Don't worry about the blog. You can always post photos of flowers and skies, and the Messiah. Try not to take on too much. I'm on the overwhelmed roller-coaster with you because of this move. Now take a deep breath. There! Glad you are feeling better. That swine flu stuff is really scary isn't it? 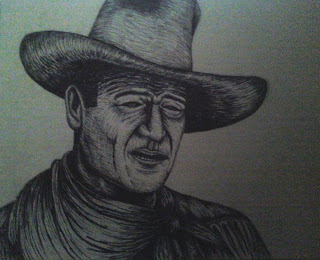 Your son is very talented, I recognized John Wayne right away. it sounds like you need some good pampering but i truly know how hard it is to give in to it. you know that most of us women suffer from the "5 E's syndrome", don't you? we think we have to be everywhere for everyone every time every day in every way. no wonder we're tired. hee hee hope you find the strength you need to persevere an that you have time to do some art soon. I'm so glad that you are doing a little better. Hang in there girl and hey.....don't let the bastards get you down, lol!!! wow, love that picture......btw you won a batch of mermaid/merman coloring books on my blog giveaway! email your snail address to artistvo@artypantz.com and I'll get them to you ASAP! thank you for all your lovely comments..! Congrats on your winning. You have a beautiful blog going...will visit again. Would You Like Sprinkles On Your Ice Cream? Dogs On Thursday: Life is Good!